Please refer to our stock # SJ0002 when inquiring. Beautiful 1950's Sterling Silver Necklace, signed " Sterling by Jewelart." 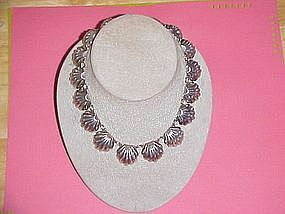 This necklace consist of 16 silver scallop shells and is 14 1/8" long. It is in Excellent Condition and just Beautiful!! !